Garrett Smith ’13, shown here at the Texas ceremony, was drafted in June by the Cleveland Indians. After a 4-3 victory May 16 on the diamond at Concordia University in Austin, Texas, knowing they would not make it back to California in time for that Saturday’s Undergraduate Commencement ceremony, the seniors pulled gowns over their uniforms, and some traded ball caps for graduation caps. A private ceremony on the road with teammates and family members in attendance at the NCAA Division III Baseball West Regional may not be the norm for CLU graduates, but it certainly evokes life as a scholar-athlete. Sometimes you have to be two places at once. George Petersen, dean of the Graduate School of Education, presided at the ceremony for eight graduating fielders and sluggers, and Trevor Koons ’13, the shortstop, served as the keynote speaker. He opted to hang his tassels from his baseball cap. 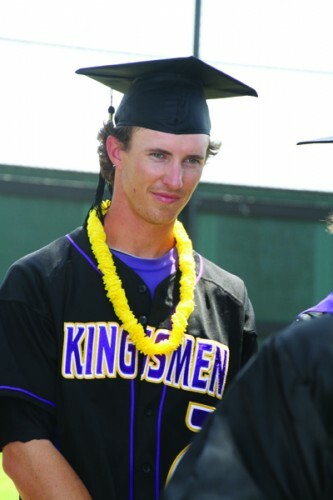 After following a processional under an arch of raised bats, Petersen welcomed the assembled, showed a video of CLU President Chris Kimball on a computer screen, and read each player’s name before presenting diplomas and posing for photos.